Maison Francis Kurkdjian is a "niche" fragrance house that has really grown on me since its debut in 2009. Its fragrances all feel like they were thoughtfully composed with high-quality ingredients, the releases are carefully paced, and the house's style is focused and consistent. 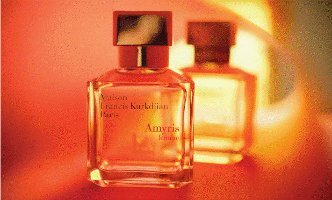 I've tried Maison Francis Kurkdjian's various feminine offerings one by one, and lately I've been enjoying the new release Amyris Femme, although it probably hasn't superseded APOM ("A Piece of Me") Pour Femme as my personal choice from the line. According to the Maison Francis Kurkdjian website, APOM Pour Femme is a floral-oriental with notes of orange flower, ylang ylang and cedar wood, "a bit of oneself to leave with others." I've realized that I really do enjoy orange blossom fragrances, as long as they're not too soapy or too sharp, and APOM has been one of my favorite orange blossom scents since I first tested it. Its floral heart is sunny and sweet — this fragrance was reportedly inspired by a journey to Lebanon, and it does have a Mediterranean feel. The orange blossom in APOM has an edible, almost pastry-like effect, as though a shell of almonds and honey were encasing the floral notes. I'm also detecting a very slight smokiness that fades in and out. In fact, APOM fleetingly reminds me of Guerlain L'Heure Bleue, which famously combined velvety orange blossom and bergamot with a refined, anise-y vanilla and a trace of incense — but of course this fragrance is far more streamlined and contemporary, and it has a very smooth cedar base that's not at all Guerlain-like. Like all the fragrances from this house, APOM has something minimalist about it — its potential for pillowiness (is that a word?) is contained within clean contours. On the other hand, about a year ago, APOM Pour Femme was released in a more concentrated, oil-based "Elixir" packaged in a set of four small roll-on bottles. The Elixir formulation also adds tonka and vanilla, making it lusher and sweeter; the one time I tested this version in-store, I swooned a bit. Amyris starts off bright, with sophisticated citrus notes, and it never really darkens as much as I expected it to. "Luminous" is definitely a good description: its notes of fruit and balsam and iris and woods are all seamlessly blended and burnished to a glow. On my first wearing, I thought I noticed a more prominent dusty-gray iris, but on repeated wearings I'm ending up with a heart and drydown of citrus-tinged amber and transparent, feminine woods. Amyris has average sillage and somewhat light staying power for an Eau de Parfum. Amyris has already been mentioned and praised by mainstream beauty/shopping entities like Lucky magazine and Into the Gloss, and these endorsements make sense to me: Amyris smells "expensive" but not overwhelming, and it's very versatile (day-to-night, etc.). It's not as distinctive as some of the other fragrances in the collection, but it's probably one of the most approachable (although it's not as "fresh" as, say, Aqua Universalis). To me, Amyris feels paradoxically rich yet sheer, like an organza scarf in deep russet or bronze tones. I still haven't purchased a full-size bottle of any Maison Francis Kurkdjian fragrance, but then again, my personal taste leans more towards the nostalgic and powdery and Rococo. However, I've thoroughly enjoyed my assorted samples, and I have bought the Aqua Universalis incense papers and some scented bubbles, and who knows, perhaps a set of the Elixir APOM Pour Femme lies in my future. Maison Francis Kurkdjian APOM Pour Femme ($175 for 70 ml) and Amyris Femme ($185 for 70 ml) are both Eau de Parfums. For purchasing information, see the listing for Maison Francis Kurkdjian under Perfume Houses. I loved Amyris when I tried it recently, and in my notes I jotted down–the essence of summer, sun warmed hay and crushed flowers. Your description is tempting. Off to find my sample and wear it tonight. V, I do hope you’ll enjoy it again and possibly review it for Bois de Jasmin soon! Despite its balsam-and-amber theme, it feels (to me) more like a summer-into-fall fragrance than a winter fragrance; you’re right, there’s something warm-weather about it! These both sound so lovely! And apparently MFK has a great sample program, so I can find out first-hand — I have four 2-ml. sprays winging their way to me from Paris. I think with the Euro conversion it comes out to around $15 for a sample set. Yes! The company is very smart about samples, too. I received MFK samples at two different department stores in NYC when I was buying other things at the fragrance counters. Nice! Jessica, count me in as one of those perfume bloggers that praised Amyris by Maison Francis Kurkdjian. I loved both Homme and Femme versions. Hello! Well, it doesn’t surprise me much that perfume-specific bloggers like the line, but I somehow didn’t expect to see more beauty-oriented outlets taking an interest in Amyris—Lucky usually has to follow their advertisers’ lead, and Into the Gloss doesn’t cover fragrance much at all. I haven’t tried the Homme version yet! I bought Amyris after I had a sample. Now that I am trying to write more perfume reviews I have been sniffing around on Frédéric Malles scents, on several other “niche” stuff, but this one still impressed me most. It is outstanding, but also wearable, and really, really well amde and balanced. Of course I like weird stuff too, but perfumes you cannot wear are like art pieces you have to hide in your cupboard. So, thumbs up for MFK, though it’s said he hates bloggers – he does not need too. Well, if I could afford it, I would buy several of his bottles unsniffed.